There is a lot to be said for pacing. You have a Pinterest board filled of projects you haven't completed. You may have some paintings in the closet and some coasters that turn to mush with moisture, but overall your board is a long list of things you'll never do. The internet is a wonderful tool to make plans you'll never keep, research facts you will never use, and all around waste time. But, I'm just planning my trip to Europe, which I will take as soon as I remodel my house, overhaul the landscaping, and finally build my career as a fitness instructor. Do yourself a favor. Quit choosing to tackle several things at once. You have great ideas, you do. You have wonderful ambition, be proud. But, you need to practice some focus. 3. Several almost successes will never beat an actual success. If you stumble through several projects at once, are you taking time to enjoy any of them? If you are constantly playing catch up and crisis manager, can you really call the end result a success? I just want to change the world. Now. Guess what. You won't change the world with thousands of mediocre accomplishments. People are unfortunate and they will remember your struggle, your haphazardness. They will know the project could have been better. I'm not saying strive for perfection, but do yourself a favor and dedicate yourself. Quit setting yourself up for small failure after small screw up. 2. Do you want to be viewed as flighty? Do you know what ADD is? 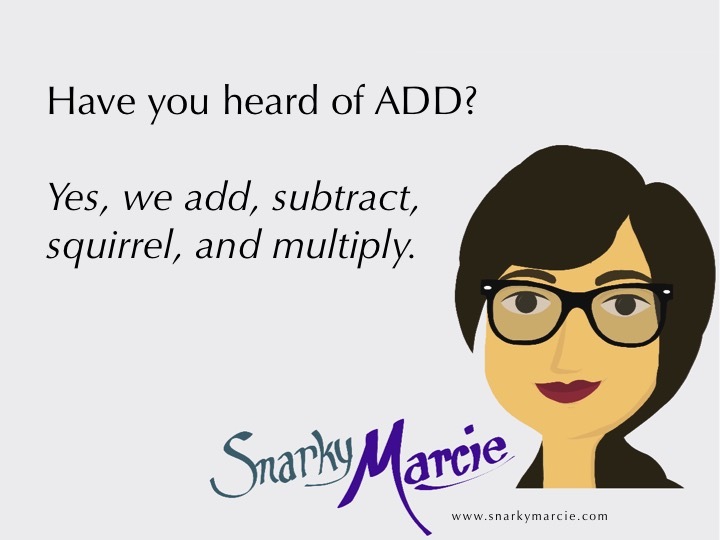 Yes, I can add, subtract, and multiply. Thank you very much. We diagnose a lot of people with ADD these days. Maybe it is correct, or maybe our environments are contributing to our lack of focus, our struggle to focus. I'm not a fan of caring what other people think of me, but you need to be aware. Self-awareness is great, but without self-management you will never grow. Tackling several projects at the same time does not make you King of the World. It makes you overzealous. It is setting yourself up for failure. Think about it. If you tackle five projects poorly, you're seen as having a pattern of poor output. If you tackle one stellar project, you're seen as a rockstar; and, you can continue with the four other projects and be five times the rockstar. 1. Pick one thing to tackle this week, and actually tackle it. Quit selling yourself short by trying to change the world tonight. Don't stop growing, but instead choose one thing to grow right now. After that is accomplished, move to the next. Can't seem to choose one thing at a time? Now is your chance to become the Master of Lists. Seriously. Go to your local Barnes and Noble, checkout their journal section and you will find notebooks dedicated to making lists. Start writing. Keep track of every million dollar idea you have, but don't act on it until your done with your current hundred dollar idea. Thanks for stopping by. I recently hit over 1000 pageviews, and I'm pretty sure only 200 of them was my sister proving that she 'Google +1's' every post. You may only read the first sentence most of the time, squirrel, but I still appreciate the effort.